I’m a huge Kimchi fan. 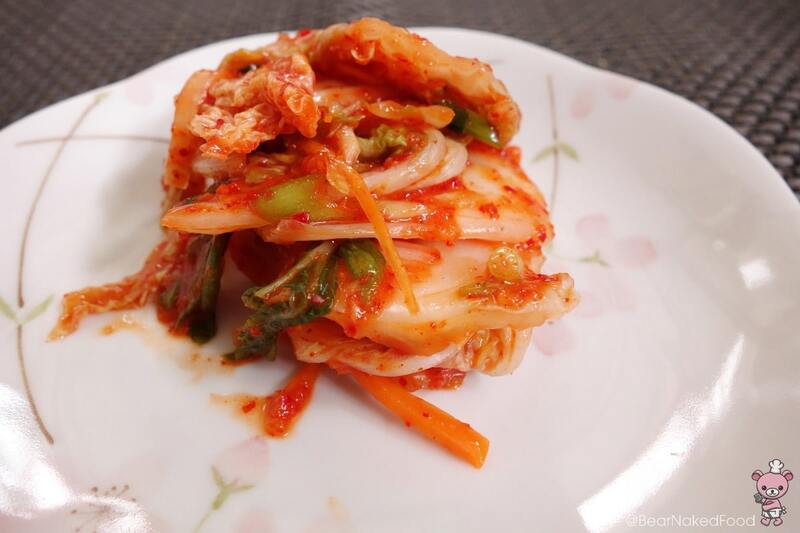 Be it baechu kimchi, kkakdugi, yeolmu kimchi, etc, I simply got to have it at least 3 times a week. 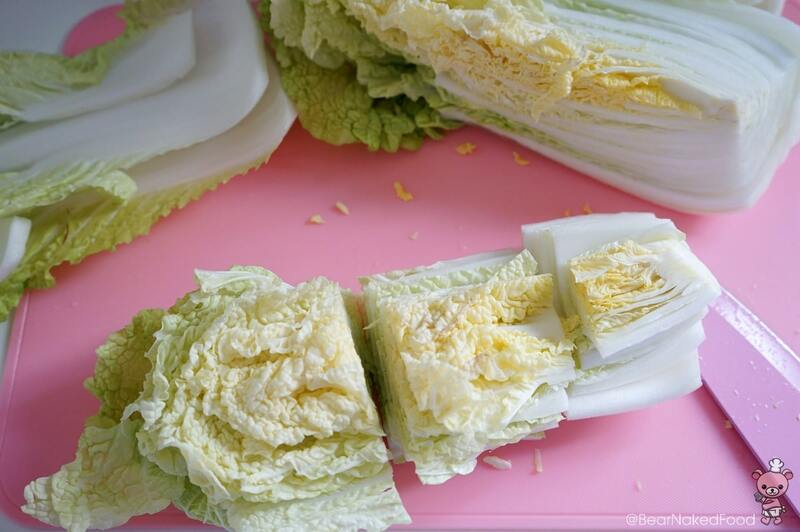 Looking at the amount of $$ I’m spending on kimchi, it makes economical sense for me to make it myself, right? 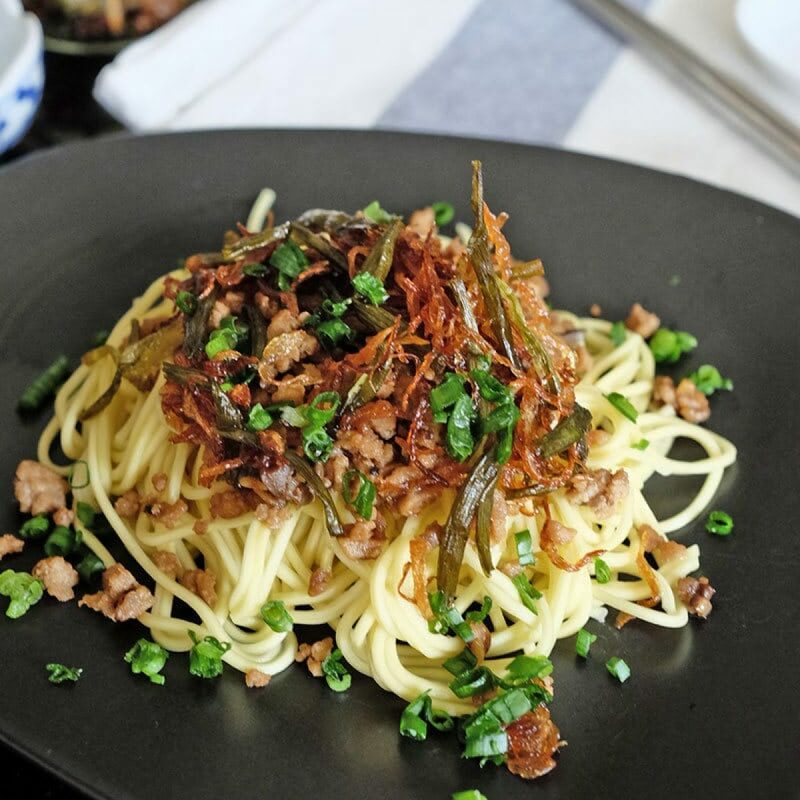 After testing a few recipes, I found this to be the most easy-to-make and yummilicious version. 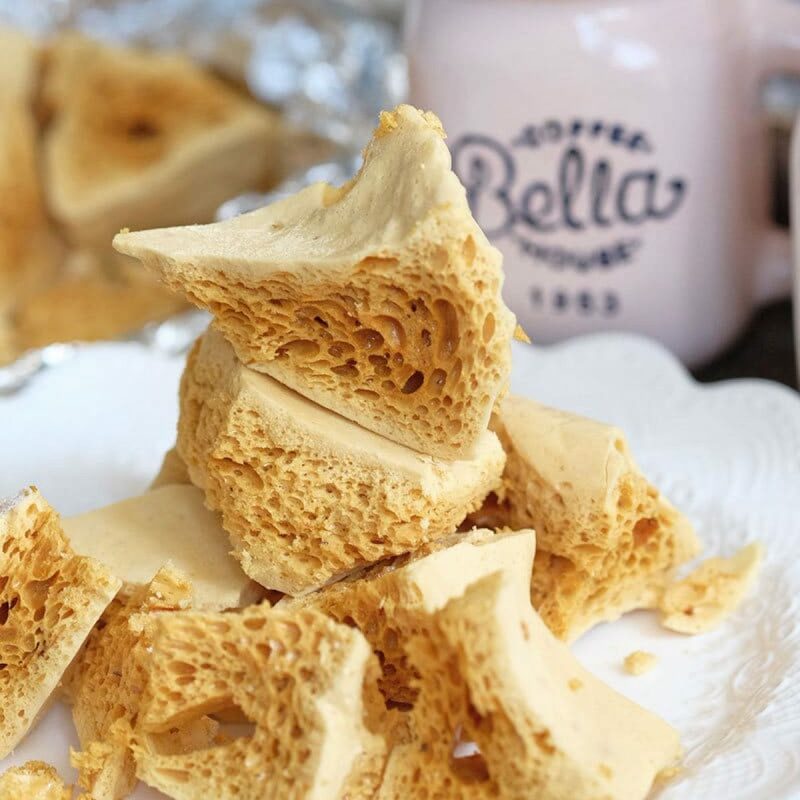 The secret step here is making the flour paste. 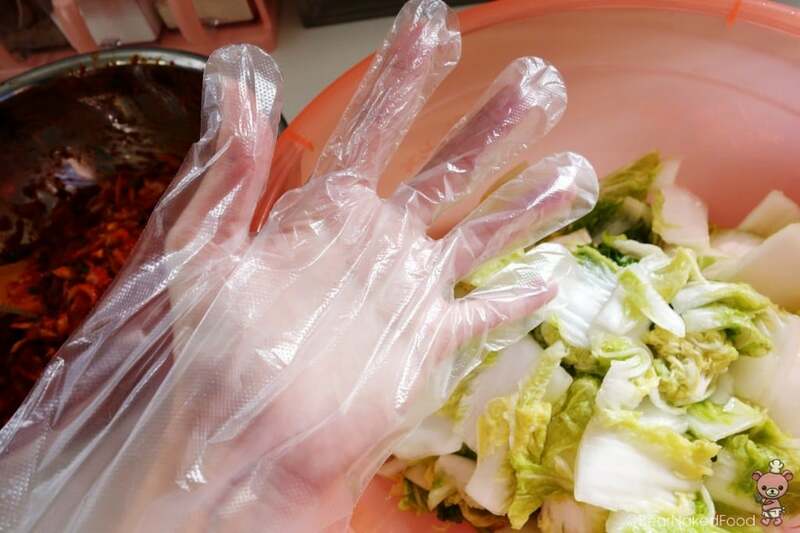 This step is optional but my Korean friend’s mom told me it will bind the spices and absorbs better into the cabbage. 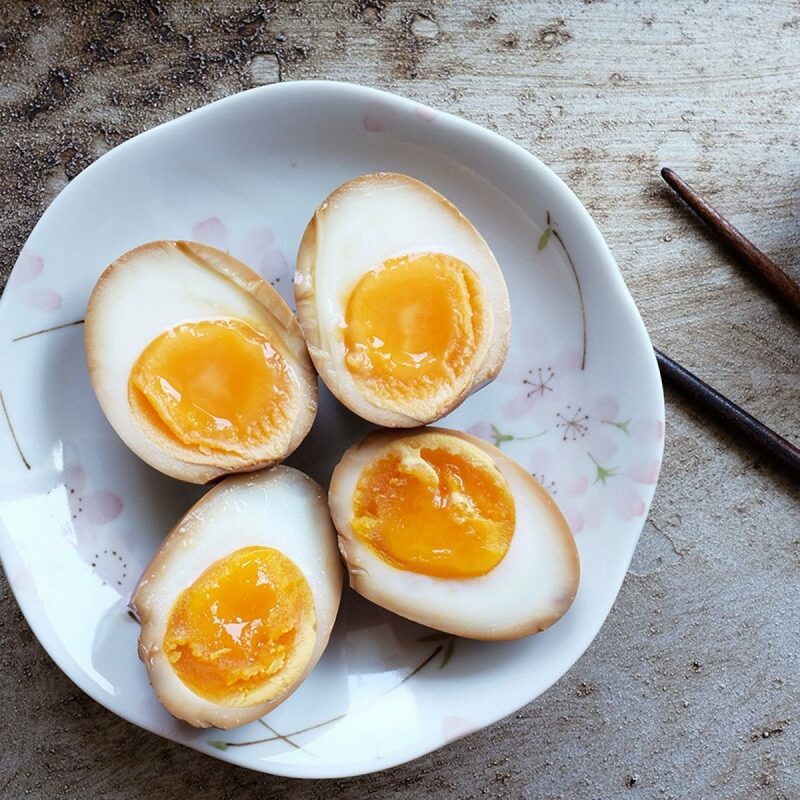 Adjust the level of spiciness according to your taste bud. 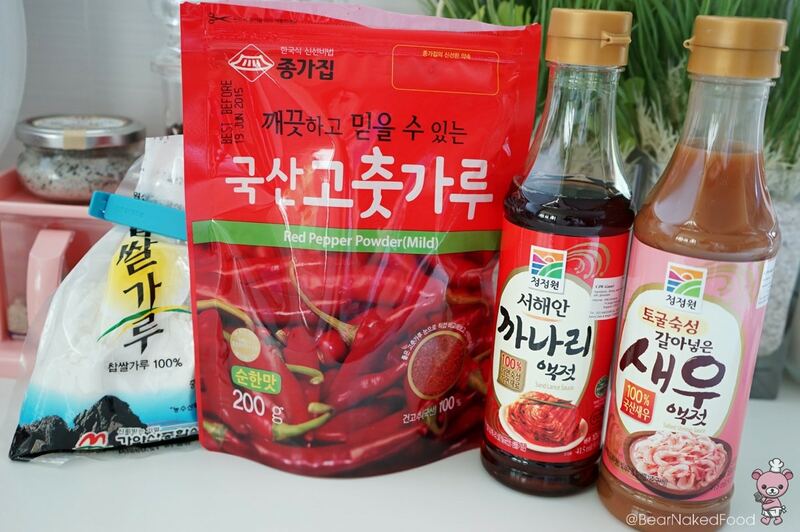 From left: rice flour, Korean red pepper powder, fish sauce, salty shrimp paste. The common name in Singapore is “Wong Bok” cabbage. This size is perfect for me. 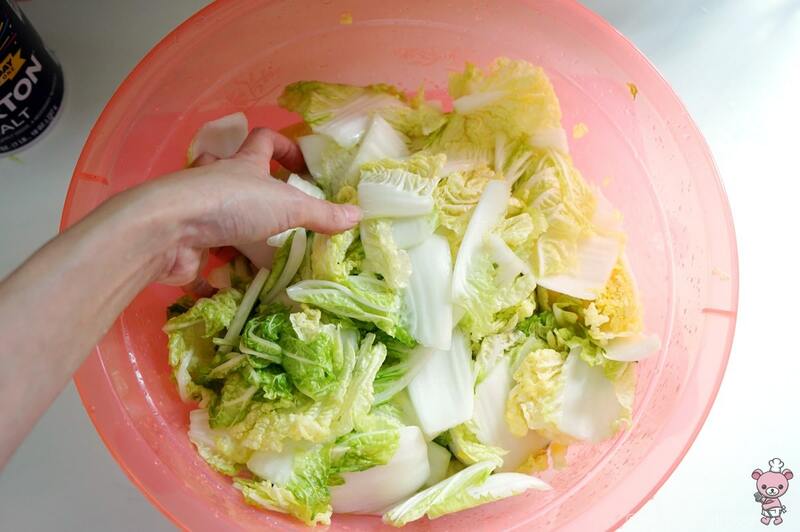 Rinse the pieces of cabbage in cold water and put them into a large plastic basin or bowl. Sprinkle salt and gently toss them around to ensure each piece is well coated. 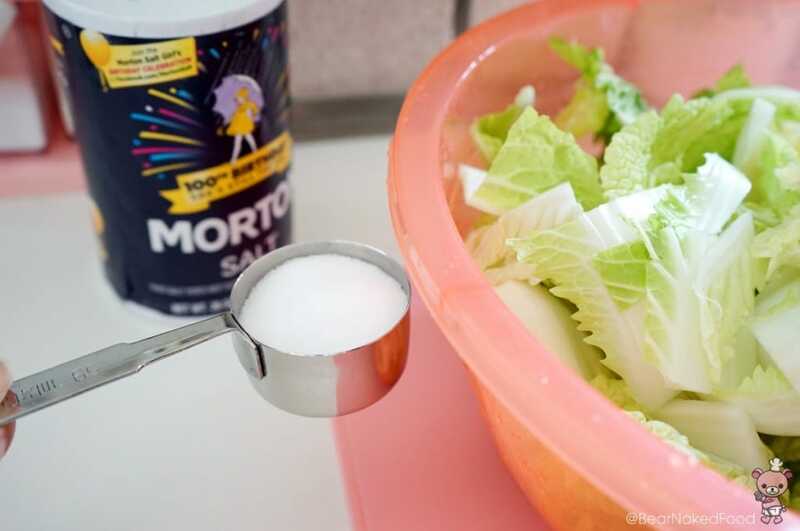 Every 30 minutes, turn the cabbage over to salt. Repeat twice. 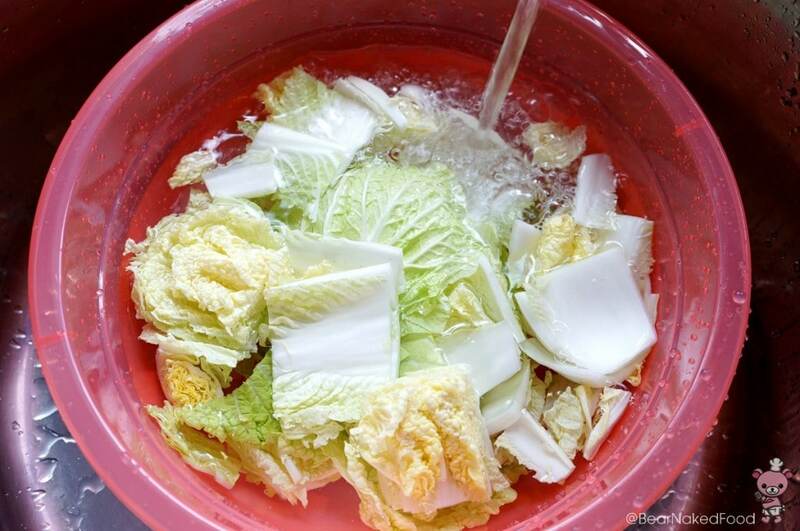 1.5 hours later, rinse the cabbage in cold water for 3 times to wash off the salt. Taste a small piece of the cabbage. It should be salty but not overly. Drain the cabbage and set aside. 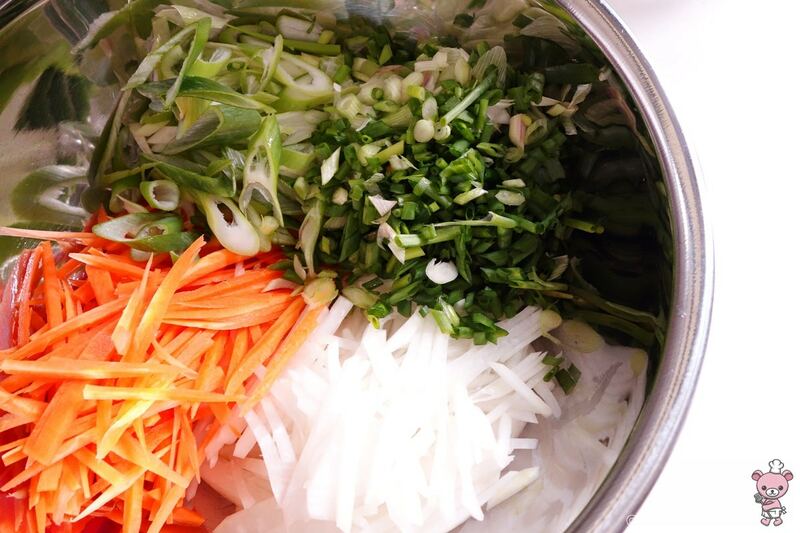 In a food processor, add in the fish sauce, garlic, ginger and onion. Blend till smooth. 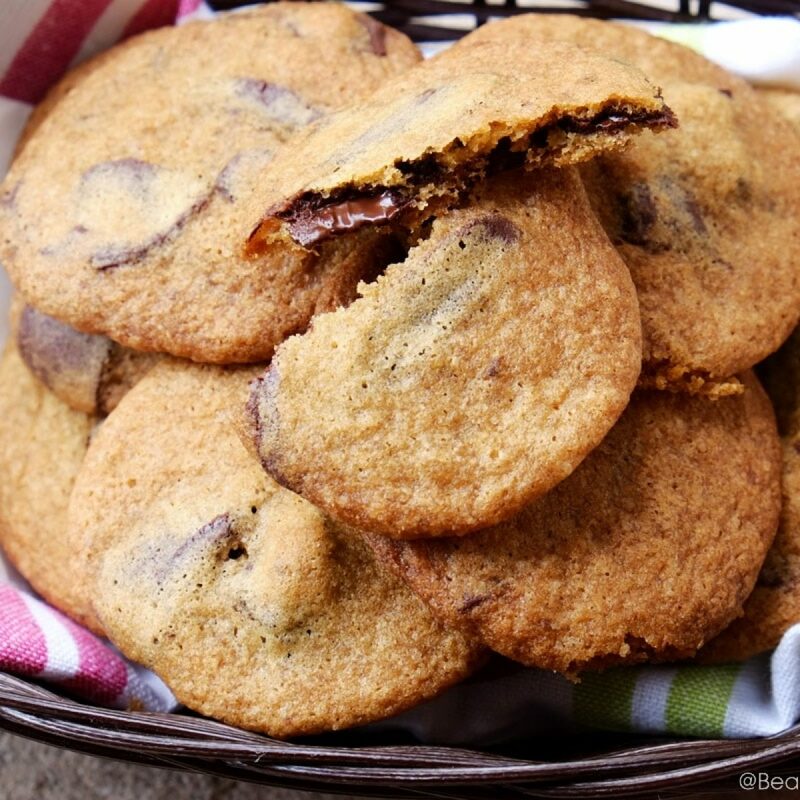 If you do not have a food processor, use a blender. Place the cooled flour paste into a large bowl. 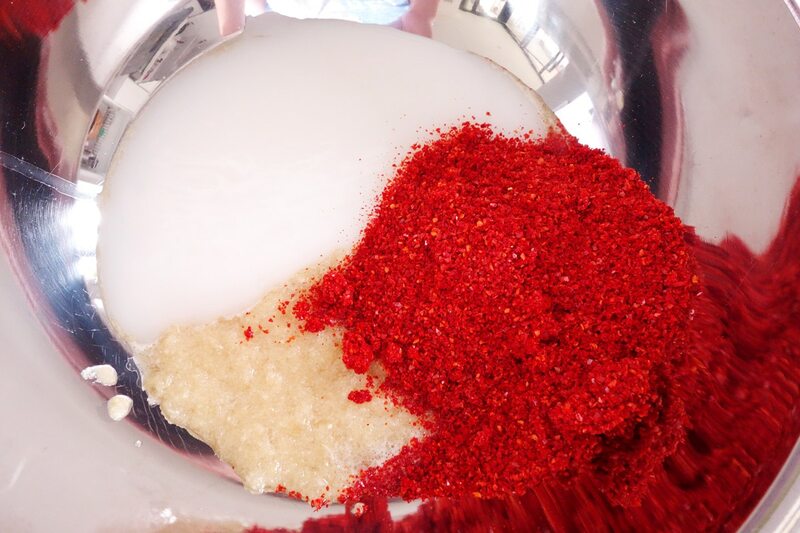 Add the blended mixture, hot pepper flakes and salty shrimp. Mix well. 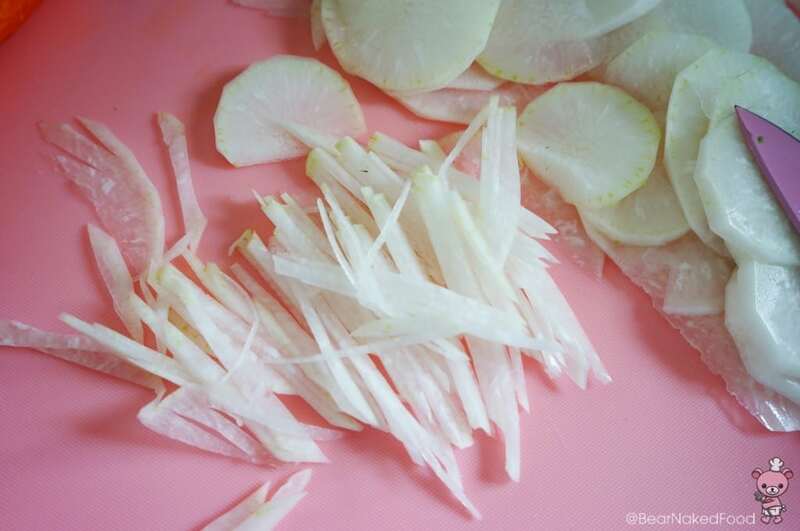 Peel the radish and carrot and julienne (slice thinly). 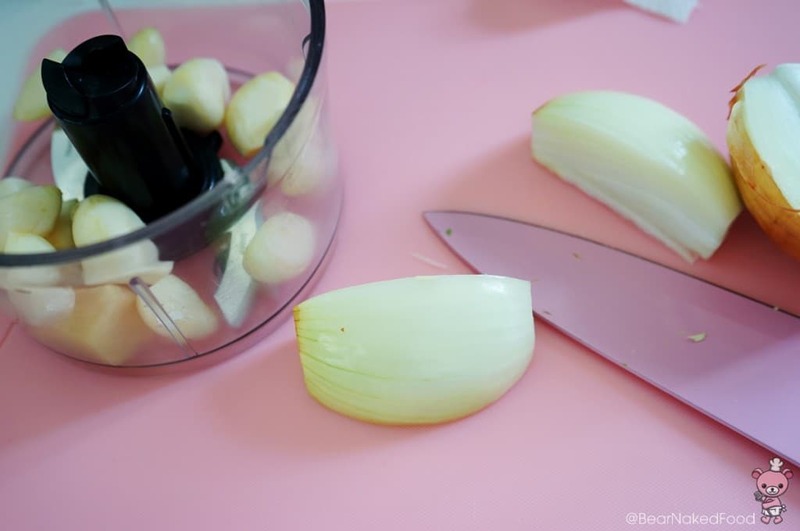 Cut the leeks and green onions into small pieces. Annyeonghaseyo! 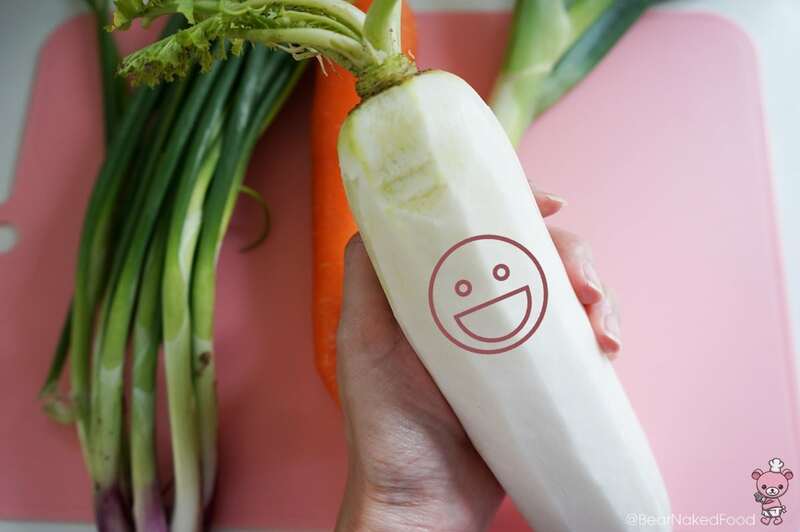 😀 I’m Mr. Radish. Put all the vegetables in a large bowl. Add in the paste and stir well. 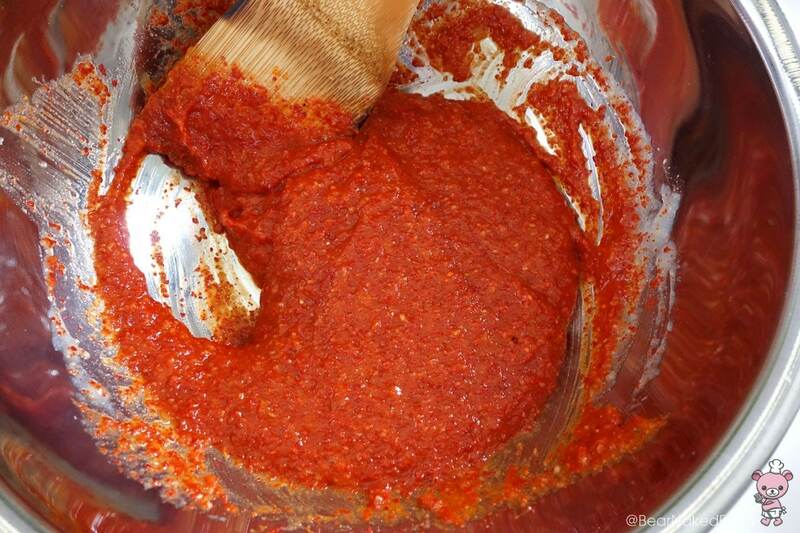 Your kimchi paste is done! Preparing for a red bath. 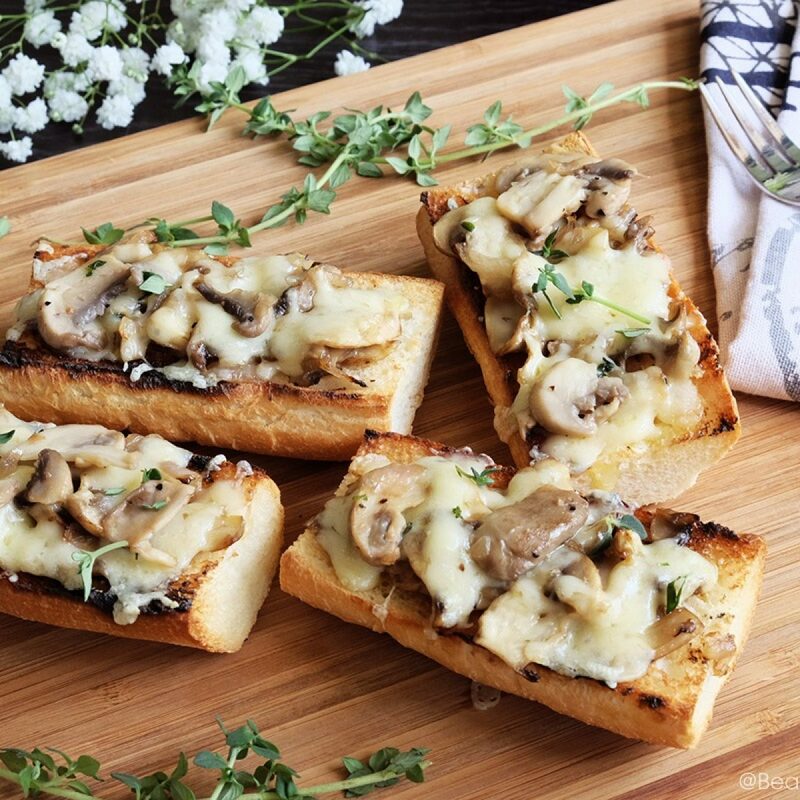 I took a bite to taste – so good! It is time to get some arm workout. 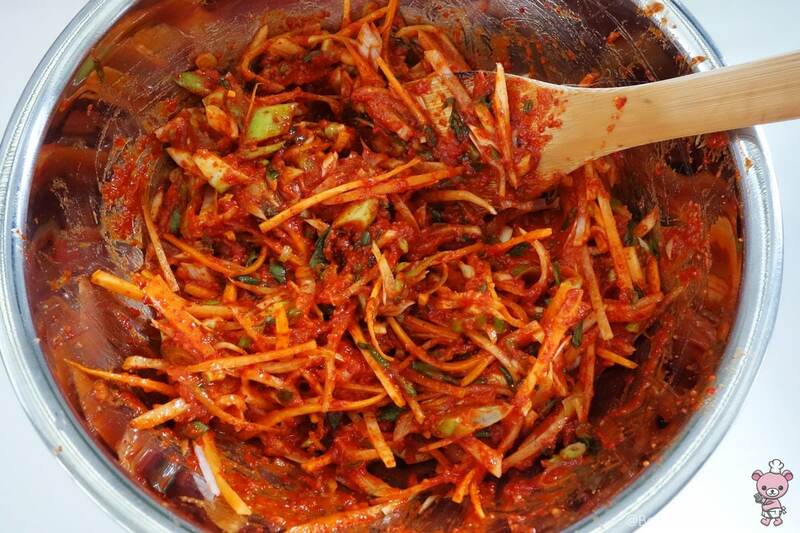 Add the kimchi paste (few spoons at a time) to the cabbage and mix, mix, mix! Do it by batches if necessary. To protect your hands from burning & staining (red pepper powder is the major culprit), wear a pair of plastic or rubber gloves. I always keep a box of disposable plastic gloves :-). Use both hands to mix (unless you are using the other hand to take photos :-P). 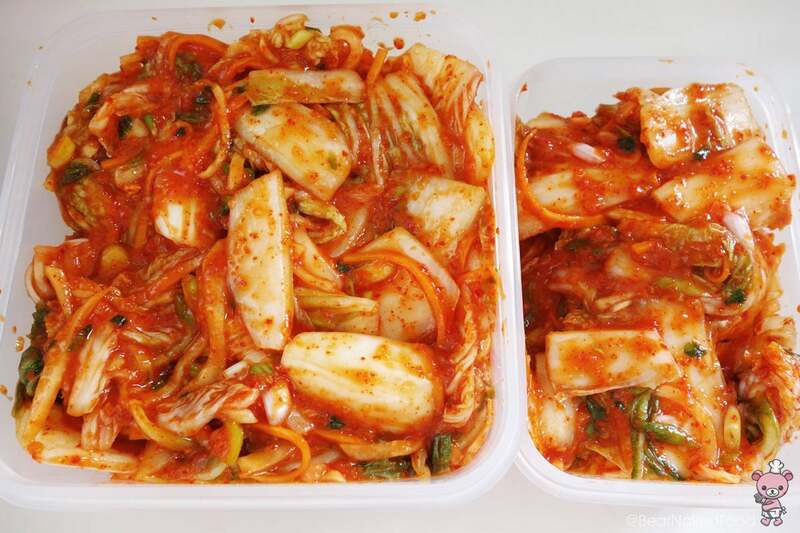 Put the kimchi into an air-tight sealed plastic container (BPA free) or glass jar. 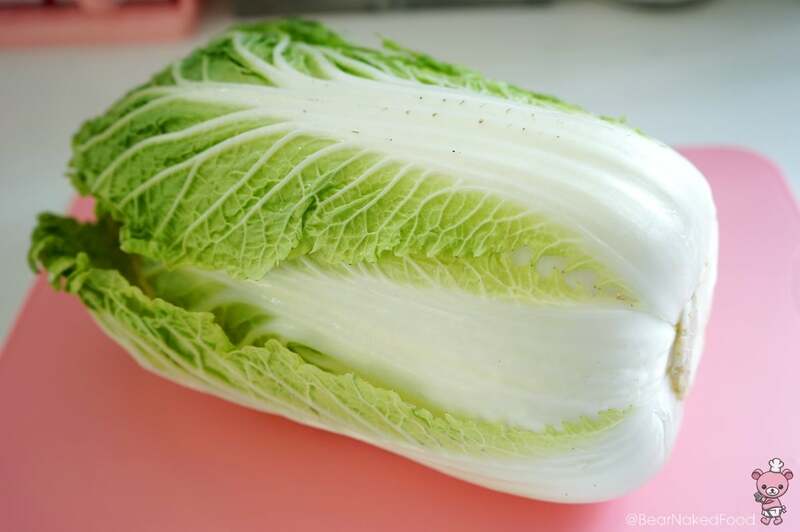 Press down to make sure no air is trapped in between the cabbage. Leave it outside for a day or two to ferment before putting it into the fridge. I can’t resist the wait so I’m taking out a tiny batch to sample. 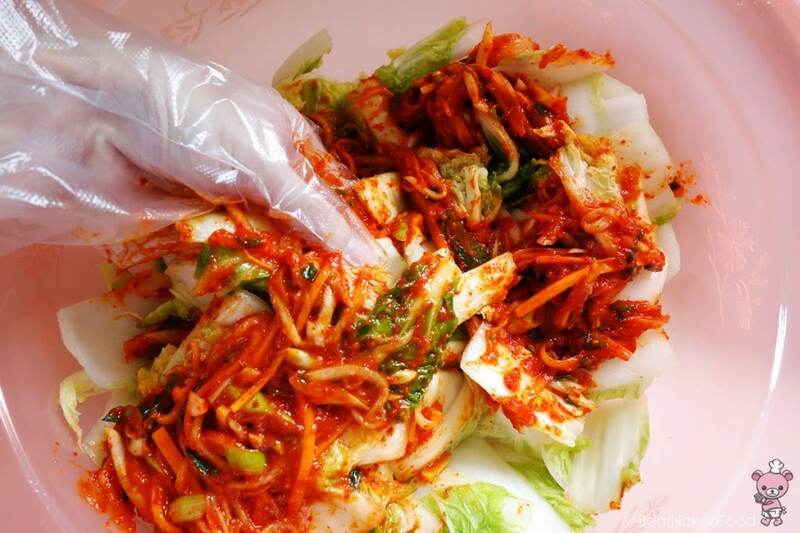 My dad’s favorite – freshly made kimchi. He doesn’t like them to be too fermented. 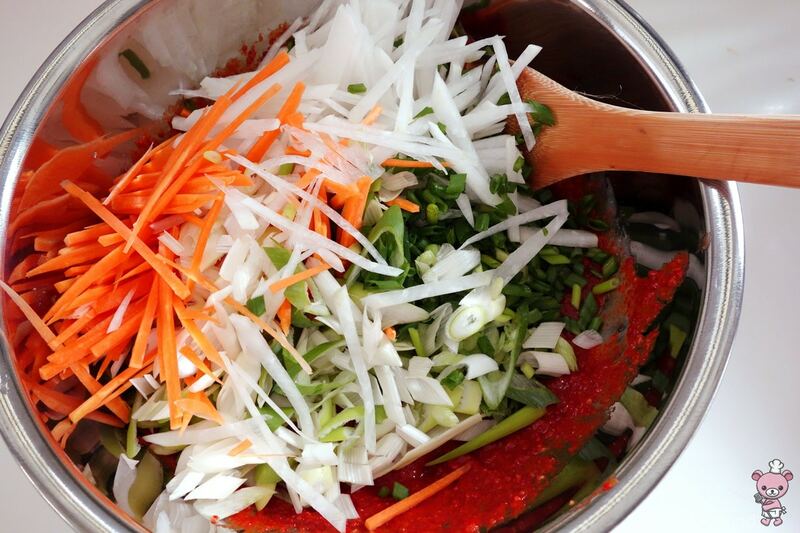 One or two days later, open the lid of the Kimchi container. 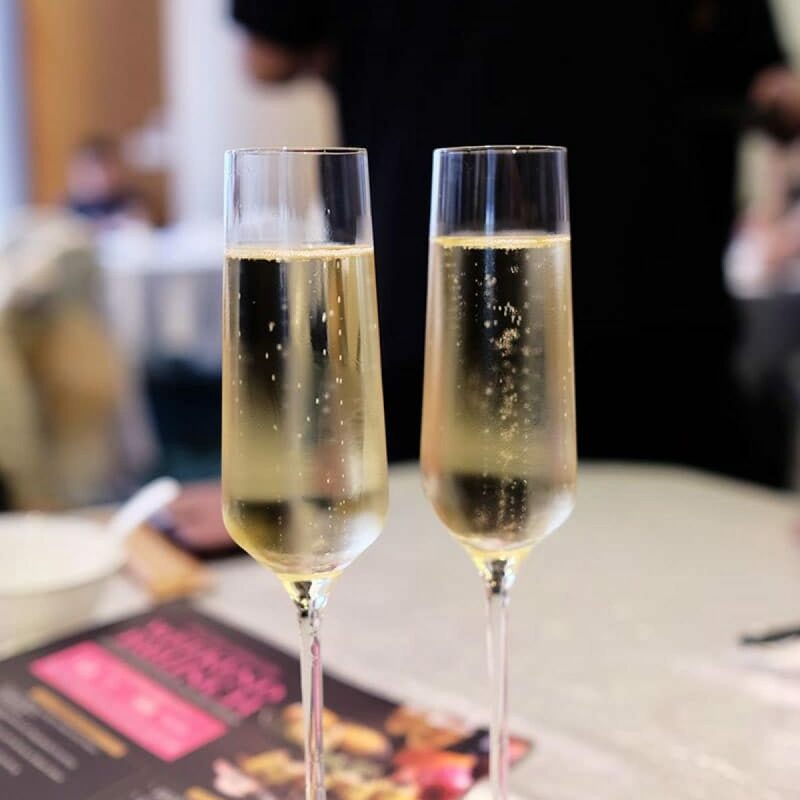 You may see some bubbles with liquid, and a sour smell. That means it’s already being fermented. 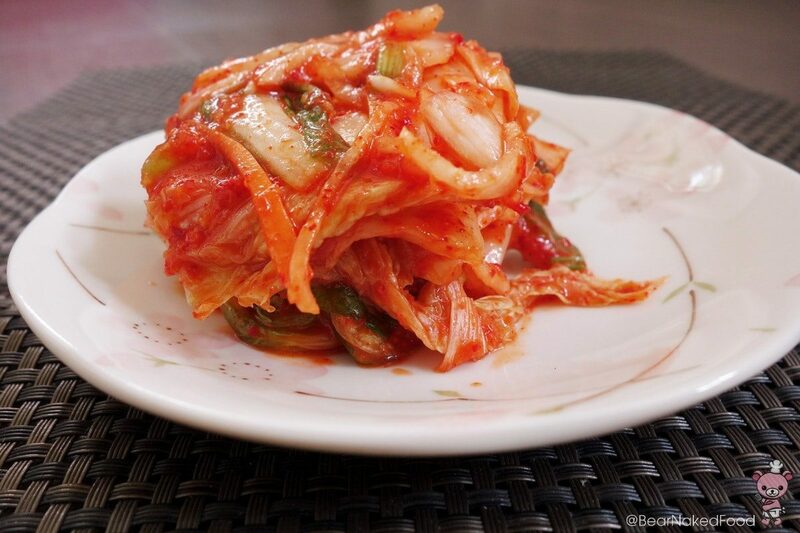 Put the container of Kimchi in the fridge for future use.